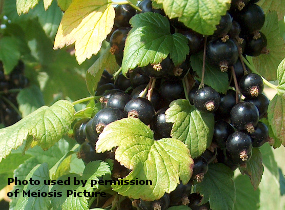 BLACKCURRANT, BEN CONNAN (Ribes nigrum Ben Connan). Fruit. Ben Lomond/Sarek cross. High yields of very large, easy to pick, full-flavoured berries. Mildew and leaf curling midge resistant. Self-fertile. Plant 3-4ft (90-120cm) apart.